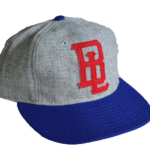 From Ebbets Field Flannels in Seattle, WA we offer this beautiful hand-made reproduction road jersey from the 1951 St. Paul Saints. 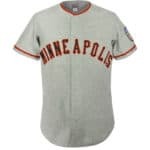 History: The St. Paul Saints made up one half of the classic Twin Cities rivalry with Minneapolis that spanned over fifty seasons. Southpaw hitters had a tough time in old Lexington Park with its 30-foot high wall in right field. The Saints won the pennant in 1938 and repeated the feat in 1949.